After three straight victorious rounds for the US Olympic and US Women's Olympic teams, today the men lost 1-3 to Russian A while the women split against Hungary. It was a tough day for boards 2+3. In the Open, Kamsky and Onischuk were bested by Grischuk and Karjakin while Nakamura and Shulman drew. 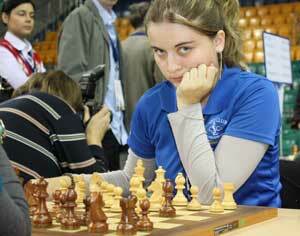 In the women's, Krush and Foisor both won while Abrahamyan and Zatonskih lost. With that win, IM Irina Krush increases her individual score to 4-0. She told CLO, "It's really beautiful here...you can really feel the full vibrancy of autumn." Tomorrow the men face Argentina (who the women vanquished yesterday) and the women will play Slovenia. See key round five games and photos below and also check out IM John Donaldson's impressions on the tournament so far. 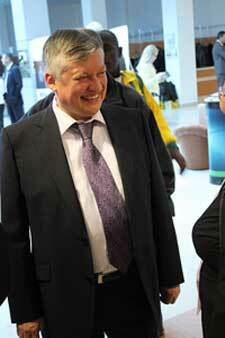 GM Anatoly Karpov is campaigning in Khanty-Mansiysk for the FIDE Presidential Election. The USCF is endorsing Karpov. Good luck!